July 9, 2014. 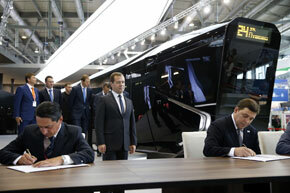 Russian Prime Minister Dmitry Medvedev, center, attends the signing of a cooperation agreement on public electric transport between the government of the Sverdlovsk Region, Sverdlovsk administration and Uralvagonzavod Corporation, and Gazprombank. The ceremony took place at the Innoprom 2014 international industrial and innovative exhibition in Yekaterinburg.